Los Angeles Lakers is a fresh warm masculine scent with hints of tart green apple. 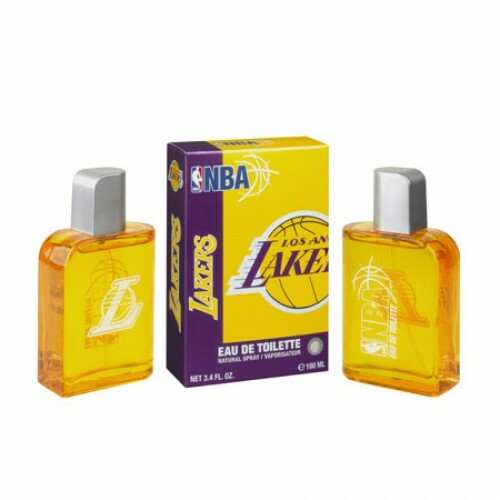 Los Angeles Lakers Eau De Toilette 100 ml. is a pleasant fruity-floral fragrance for men. This is a very fresh cocktail of vital tone, rejuvenate your body and stimulate the mind. Los Angeles Lakers is intended not only for the sports-minded men, but also for individuals who prefer a comfortable and relaxed style. Become a professional player in the NBA - National Basketball League. With unique perfume Los Angeles Lakers, especially in the summer warm weather. Los Angeles Lakers played the most typical male traits. Courage, strength, determination and desire to win. All these ingredients can be found in colored glass flacon, which is adorned with a sleek silver cap and motives of the popular American games. The box, which protects against damage this perfume is also brought out in the spirit of basketball. Get news Los Angeles Lakers and drift pleasant fragrance energetic adrenaline and joy of movement. A refreshing blend of fruit and flowers commences with the aroma of juicy apples, which mixes tones beneficial tea, cool water and optimistic chords oranges. After the initial dose of freshness comes the elegant and sensual interplay of flowers and precious wood. Unique tonka bean, together with a unique dry lavender and cedar passing game senses. A nice finishing touch is performed earthy moss, vetiver and seductive musk. Eau de Toilette Los Angeles Lakers has medium endurance. The NBA is the best sport in the world! Kobe Bryant, LeBron James, Dwyane Wade and Shaquille O'Neal, who is your favorite player? The NBA is the most famous professional basketball league in North America. Who is your favorite NBA team? Boston Celtics? Chicago Bulls? Los Angeles Lakers and Miami Heat? And what about the taste of perfume? Try the hot Miami Heat and Chicago Bulls strong! Each perfume from various NBA teams can find something original and unique! Los Angeles Lakers great refreshes you and gives taste to win. Recharge your energy and vitality of the pleasant tones of fruits, flowers and wood, and you will taste what it's like to play for one of the most NBA teams!